For over 25 YEARS, TAP members have enjoyed the experiences of "Rally in the Valley". 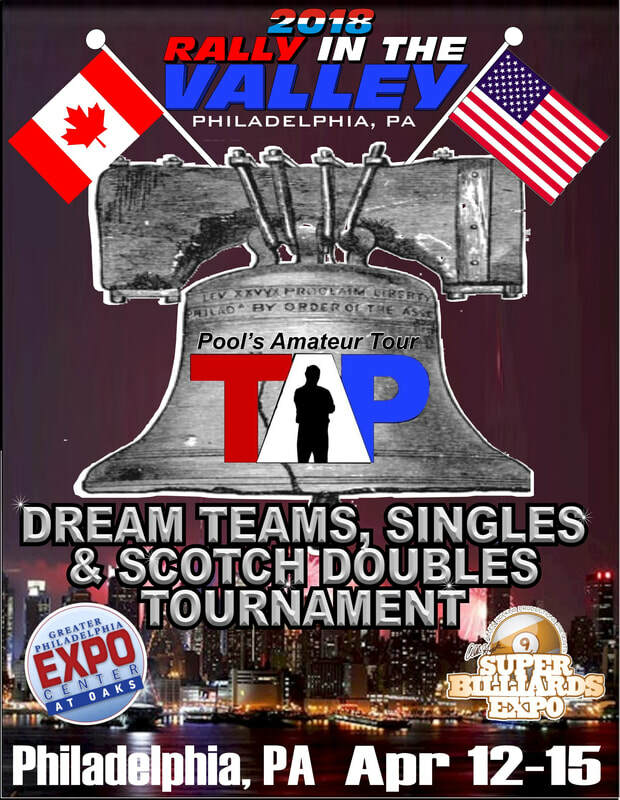 Team or single events, there's something for everyone at what's been called a "fantasy land" for pool players. Don't want to play in a tournament, that's ok too. You should still come and check out all the cues, cases, apparel & gadgets that are on sale. This event can be summed up simply as "A Candy Store for Pool players". Check it out, you won't be disappointed. Grab some friends and build a team. For this event TAP members get to handpick their team. Members who may not be able to shoot together weekly can get together for this event and renew friendships. It's just not about pool when it comes to TAP. The concept of this event was driven from the 1992 Barcelona Olympics basketball gold medal winners. TAP knows that our members come to play, and we deliver. With our round-robin format we guarantee our members (4) rounds of play in either type event. Teams or players are divided into groups of (4) and will compete against everyone in that group. Afterwards, depending upon your points won, you are place on (1) of (2) single elimination boards and continue play to a winner. No need to bring a pocket full of change. Tables are open for both type events. Cues, cases, apparel & gadgets are just some of the things you'll come across at this event. See the pros firsthand as they come to compete. Watch the trick-shot artists perform their magic for top honors. See amateurs show their skills around the table as they compete. Events include pro & amateur events, senior & junior events, as well as trick-shot exhibitions. Looking for a special pool accessory? All types of pool accessories can be found. Cue dealers are plentiful and willing to discuss their craft with you. If you're looking to buy, this is the place. Whether it's to experience the thrill of competition, learn from the best, buy that special item, or just to soak up the atmosphere, TAP's Rally In The Valley will offer you fond memories that will resonate for years. "After all the Rest, Why not the Best"